Lake Guntersville State Park is the only state park in Alabama that is on the Trail of Tears National Historic Trails Register. 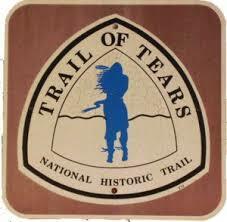 The Trail of Tears National Historic Trail encompasses more than 800 miles of 14 land and water routes that began in North Carolina and ends in Oklahoma. A section of this trail passes through the park and continues into the town of Guntersville. Forced removal of Native Americans began in 1831. Between 1831 and 1837 some 46,000 Native Americans were forced from their homes in the southeastern states. Many of them suffered from exposure, disease and starvation on their route to their destinations. Sadly many Native Americans died as a result including 2,000-6,000 of 16,542 Cherokee. Cherokee was not the only tribe removed; others include Creek, Seminole, Chickasaw and Choctaw Nations. The Trail of Tears is an important part of this park's history, and for the last three years we have commemorated this event at the park. This year we will offer guided canoe/kayak tours along the water route, Native American plant uses, finger weaving, artifact displays, and guided walks along a section of the Trail of Tears.